A large donkey (who is missing a tail) is on the wall. Each player is given a tail with a pin attached. One by one the players are blindfolded, and with the assistance of the birthday boy or girl, are gently spun around a few times then pointed in the direction of the donkey. 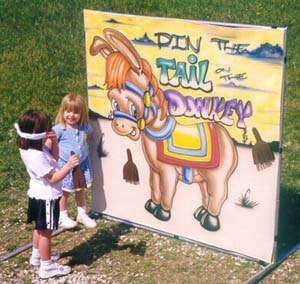 Each participant then attempts to pin the tail on the donkey in the right place. Whoever pins the tail closest wins.